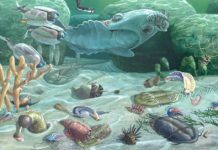 The Tertiary Period ran from approximately 66 million years ago to about 2.58 million years. While this term is no longer officially recognized by International Commission on Stratigraphy, it is still one that is used on a widespread. 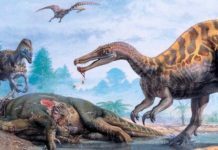 Nowadays, this period is divided between the Paleogene Period and the Neogene Period. This term began to fall out of fashion because while it was suitable for the area in which it was originally designed, Italy and the Alps, it didn’t apply neatly to parts of Europe or to North America. This period on Earth’s timeline saw many different kinds of change. Not only biological and climatic, but also geologic and oceanographic as well. When it began, sea levels were fairly high and the climate was warm. Then after the K-T Boundary, the temperate weather gave rise to differentiated climate zones and polar glaciation began. 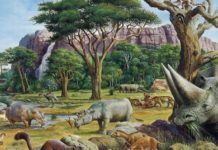 And after the dinosaurs were wiped out, mammals stepped up to fill the ecological niches these animals left behind. The warm climate at the beginning of this period of time favored dense jungles and forests, but as the climate became cooler, it allowed other plants to establish and spread widely. And grasses are some of these plants that gained a foot hold during this time. As these grasses spread across the world, it helped to feed ever growing herds of grazing animals. 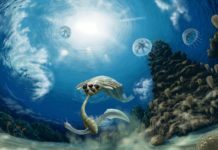 Mammals weren’t the only living organisms to enjoy this new age, however. 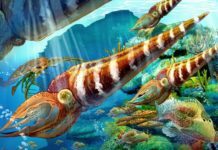 Flowering plants, insects, deep sea creatures, birds and a variety of mollusks began evolving. By the end of this period, primates rose to prominence, as did Great Apes and Homo sapiens as well. Tectonic activity continued on as well. 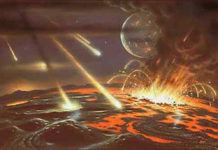 Gondwana would eventually split all the way apart and the subcontinent of India would collide with the Eurasian plate. Antarctica drifted to its current position and a lot of volcanic activity occurred during this time. And with these geological changes came even more changes to the climate. Eventually, as the Earth continued to cool, there was an Ice Age by the end of the Tertiary Period. All of the mountains of the world were glaciated, as were the poles. As these glaciers formed, they used more and more sea water and as a result, several land bridges began to emerge. There was a land bridge between North America and Asia; one between Europe and Great Britain, and one between Borneo and Southeast Asia. All of these land bridges allowed plants and animals to migrate.